This weekend, at the Joomla World Conference in Rome, PWT released a number of new extensions. One of those is called PWT SEO and I believe this is the ultimate Joomla SEO extension many people have been looking for. It guides you perfectly in optimizing your Joomla articles. First of all, the company PWT may need a short introduction: The owners are Sander Potjer and Martijn Boomsma and they have a dedicated team working for them. Many may know them for their work for the global Joomla organization while Sander is also the guy behind the ACL Manager extension (which is now also a PWT extension). So you guess the quality of the extensions should be top. I myself am also a member of the team by the way, so I may not be totally unbiased ;) Still, my role was basically asking for SEO goodies and the developers simply got to work building those. All extensions can either be bought individually or as a package with 3 options: Personal, Business or Agency, depending on how much support you need. No free versions by the way. So, what is the aim of PWT SEO? In short, it aims to take you by the hand while you are editing and SEO-optimizing your articles. It does so right in the Joomla article, so there is no need to change your workflow, it just improves it. No need to switch views. In Wordpress, there are a few extensions that more or less do something similar, but in Joomla, so far there wasn't anything like that. Once you define an SEO Keyword or key-phrase, your SEO score is calculated. Based on the keyword or phrase, you will get points for using that keyword in strategic parts of your article, like the page-title, metadescription, text, headers etcetera. However, it also does some pretty advanced stuff by also looking at the URL your article will be shown on. The plugin will even take into account the full HTML of the resulting page: so it does not only look at the actual article, but also at the output of the modules! By the way, note that PWT SEO does not change your URL's like many of the SEF extensions like SH404SEF and JoomSEF, they have a completely different purpose. Though they overlap in some parts, you could use them side by side. The best way to show how the plugin works is to simply start working with it: Open the tab, and fill in a keyword or phrase. For this example, let's use the key-phrase pwt seo. If you then save the article, an initial SEO score is calculated. At first, we have only 22 points (out of the maximum of 100), but the article is almost empty, so that is not strange. 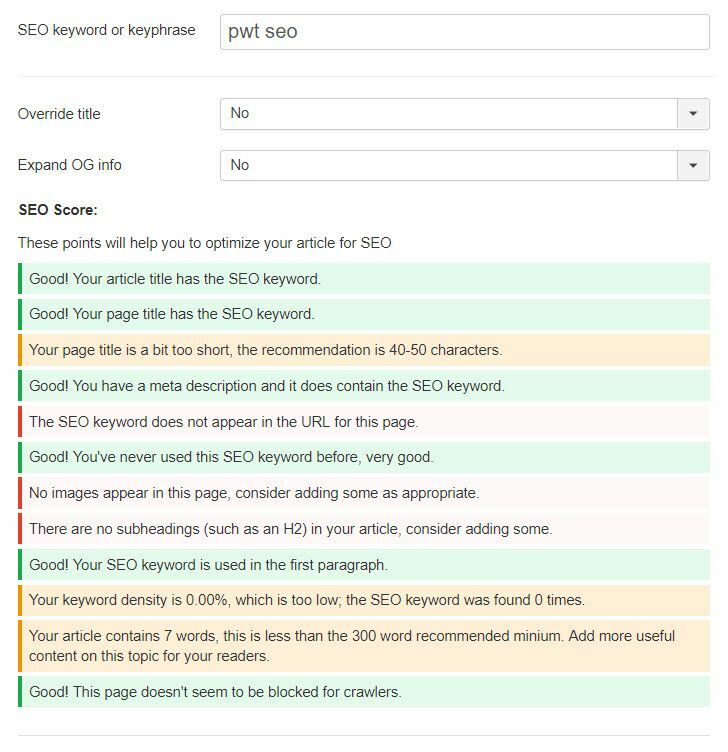 Now if you simply start typing text in the editor, the SEO score is re-calculated every 30 seconds. You can change the interval in the plugin-settings if you want. Note that the score is automatically calculated as you go, you don't have to hit the Save button for this. To look at what is wrong, you have to switch to the SEO-score tab. We thought about putting it in the sidebar on the first tab, but this view will be too cluttered in our opinion, so that is why it is in a separate tab. Now simply start fixing the items that need fixing. Note by the way that you should not overrate the plugin: it is still an automated solution to help you find issues. My advice for best use would be to start writing an excellent article without looking at the SEO tab. Once you are more or less finished, THEN look at the SEO tab and see if you forgot to use your main keyword in some of the strategic locations. Also, don't let the plugin DICTATE how you write. If you consciously use a phrase that the plugin does not like, but you think it is still good for SEO, of course use your own phrasing. But, having said that, the plugin will definitely be a great help for many. This is the most important field to fill in correctly. Every article should preferably have a unique keyword. Note that the plugin will warn you if a keyword has already been used. You should really think very good about choosing your keyword: make sure it is spot-on for the article that you will be writing. Choosing a good keyword is the one thing that the plugin cannot do for you. Be aware that we chose a fixed maximum of 55 characters for the page title and 150 for the metadescription. This is usually pretty close to how Google works, but Google uses different displays in many situations, so they may differ slightly. Also note that if Google does not think you settings are correctly related to the text, it may display your site differently. If you leave this to No, the page title as decided by Joomla will be used, which will usually be derived from either the article or menu-title, or even the Browser Page Title field. However, if you set it to Yes, it will simply override all those values and use the one you configure, which is probably be the best workflow. Anyhow, make sure your own workflow is aware of this hierarchy. If you set this to Yes, you can enter specific settings for your article so that open-graph info is generated for your social media channels. Note that if you leave the fields empty, nothing will be generated, there is no auto-generate option here. Note that you can even set this to Advanced Mode in the plugin settings. This will allow you to use completely custom metatags instead of the fields already offered to you. Note that 99% of users does not need the advanced mode. These values all count for the SEO score. Here you will find results for the resulting page, which is the actual article output PLUS that of the surrounding modules. Note that these values don't count towards the SEO score. This is because many of the modules will affect the site globally and you simply cannot fix this within an individual article. From here, you can directly click an article and enter the article-editing view. Saving an closing will also leave you in this view. We also though about mentioning these scores in the core Article-overview, but we will probably add quite a lot in future releases, so we decided to stick to our own component overview. I hope you are as enthusiastic about this extension as I am. The extension is brand new, so you may find a small issue every now and then, but the PWT developers work really fast, so any issue will be fixed real soon. And maybe you will have new feature-request that can be included. By the way, note that for the next 2 weeks or so, the extension will be labeled as Beta, as we almost have daily changes with small new features and improvements.